Lowering and consolidating seven current tax brackets into three: 10%, 25% and 28%. Essentially doubling the standard deduction for most filers, thereby achieving huge simplification for millions of average income filers. Eliminating the state and local income tax deductions and capping all others, except for charitable deductions, at 2% of Adjusted Gross Income. Doubling the Earned Income Tax Credit for childless filers, thus encouraging more low income people to work. Exempting taxpayers over the age of 67 from the employee-side payroll tax, encouraging them to stay in the workforce longer. Cutting the corporate tax rate from 35% to 20%. Allowing 100% immediate expensing for all capital investments, including inventories. Creating a territorial tax system so that multinationals are not taxed on foreign earnings, and therefore incentivized to bring their foreign profits home. Eliminating the deductibility of interest expenses. The lower individual and corporate tax rates, together with the separate investment and work incentives, will create a significant economic stimulus estimated to raise GDP by at least .5% per year or higher, depending you who ask. According to the Tax Foundation, however, the plan would reduce federal revenue on a static basis by $3.66 trillion over ten years, and even by $1.6 trillion on a dynamic basis, taking into account the new tax revenue generated by the plan. This is, of course, a huge problem. 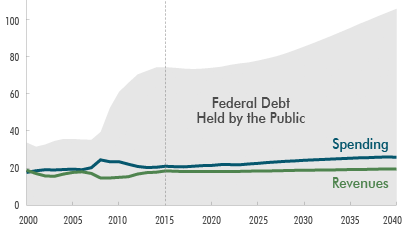 We badly need to speed up economic growth but we also need to lower, not increase, our annual deficit spending in order to put our debt on a downward path as a percentage of GDP. The resolution of this quandary is to tighten up on those deductions, such as for mortgage interest, remaining in the code and also lessening the amount of the tax cuts if necessary in order to achieve overall revenue neutrality for the plan. This entry was posted in debt, deficit, Jack Heidel, Jeb Bush, New York Times, tax rate cut, tax reform, tax revenue, Wall Street Journal and tagged debt, deficit, Deficit spending, economic growth, fiscal responsibility, jack heidel, New York Times, tax reform, Wall Street Journal by jackheidel. Bookmark the permalink.